Accessible parking bays are located on levels 7, 8, 9,10, 11, 12, 13. There is a ramp to the Carpark lifts. Complimentary Electric Vehicle charging available on Level 8 green zone. Atrium Carpark Management office is located on level 5 in the Carpark building. 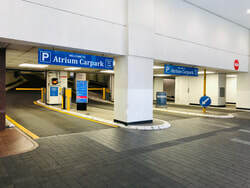 When you spend a minimum $10.00 or more at any Atrium on Elliott outlet (www.atriumonelliott.co.nz), you will receive Discounted Parking. 1. Only applies to Casual Day rate parking only. Not to be used in conjunction with Earlybird and any other parking promotions. 2. Only valid with a same-day proof of purchase of $10.00 or more from any Atrium on Elliott outlet. 3. Take your same-day proof of purchase and your parking ticket to the Management Office on level 3. For after hours, please take your same-day proof of purchase and parking ticket to the Carpark Office on level 5. If you stay longer than the discounted hours, additional parking fees shall apply. Please refer to our rate. 4. Once the parking ticket is validated, you will have 10 minutes grace period to exit the carpark. Please take the lifts and return to your vehicle. 5. Insert your parking ticket at the Exit Machines. For any assistance at any time Help Buttons are located on all Exit Machines. Or, see Atrium Carpark Attendant on Level 5 in the carpark building. 1. Please take a parking ticket from the entry unit. 2. Drive up to the level 11 control point. 3. Insert your parking ticket at the control point. 4. Drive up and park your vehicle at any available bay beyond the control point. 5. Take your parking ticket to an automated pay station located on levels 2 or 4. 6. Insert your parking ticket into ticket slot, the amount $18.00 (Earlybird) should then appear on the screen. 8. Make payment by cash or coin, Credit Card or Eftpos. For payment by Credit Card or Eftpos, please follow the instruction on the pin pad. 9. If you would like to obtain a receipt, press the receipt button, the third button down a tick will appear next to the button. We strongly recommend that you take a receipt. 10. Your parking ticket will then be returned to you, any change and your receipt will be returned in the bottom draw. 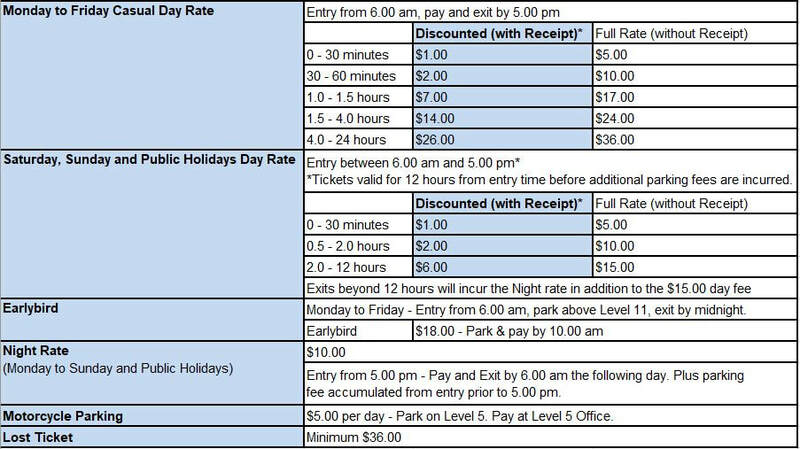 IMPORTANT: If you fail to park above level 11 and pay before 10.00 am, casual parking rate applies. 11. Drive your vehicle to the level 11 control point. 12. Insert your parking ticket at the control point. 13. Drive to the exit units located at level 5 and insert your parking ticket, the barrier arm will be raised allowing you to exit the car park. For any assistance at any time Help Buttons are located on all Pay Machines. Or, press Cancel button, take your parking ticket and see Atrium Carpark Attendant on Level 5 in the carpark building. Pay stations are located on Levels 2 and 4. You can pay using Credit Card, EFTPOS or Debit Card. Remember to take your ticket and change when you finish! For Assistance press the HELP button. Once you have paid, and removed your ticket you have 10 minutes in which to exit the car park.